How Does the People Site Work? 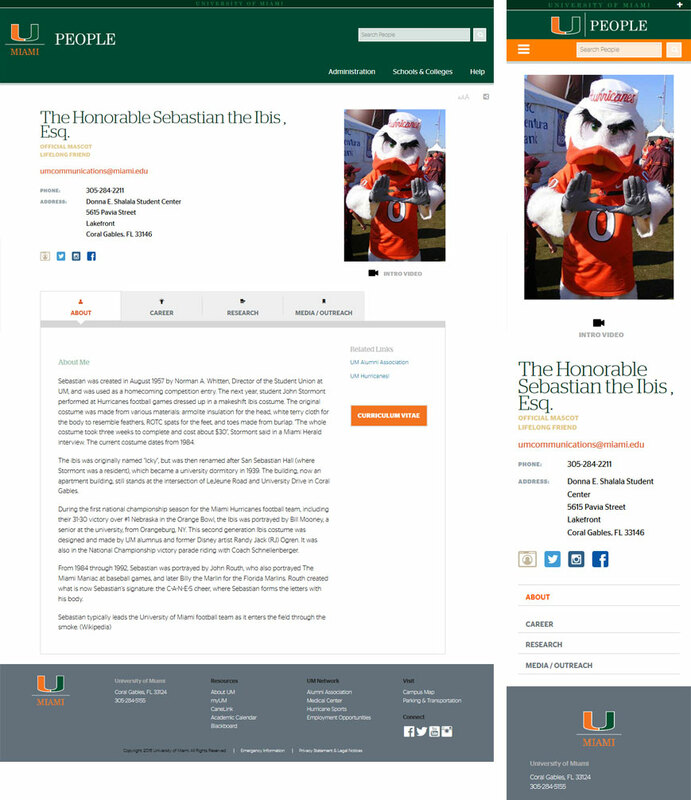 Browse this page for a brief explanation of how the University of Miami People Web site works. The site pulls basic information from Workday and can also display more information that can be added by working with a People Profile Managers from your respective area. UM People consists of two main components, People Profile Pages and People Lists. The "Basic" information that appears on a people profile page is created using data derived from Workday, which users can edit and update themselves in Workday, and which then will be automatically fed to the People profile. In addition, individuals can work with their People Profile managers to consider and add additional "Advanced" information to their profile pages that can contain more material. By adding additional material, your profile page can begin to look different with the new material added. People list pages are pages containing lists of people. The People Site allows People Profile Managers the ability to create lists of people to display on other Websites at UM. The nice thing about these lists is that they reflect information that comes from Workday as well. If a person leaves the University, changes e-mail, phone, location, name, etc..., the People List Page can be updated easily to display the correct information. This makes having to hard-code and build directory list pages easier to maintain. Some examples of People List pages are here, here, and here.